That's My Dog springs into newly enhanced training programs! - That's My Dog! Home / Featured / That’s My Dog springs into newly enhanced training programs! After a long, cold winter, the Midwest has emerged from hibernation. Here at That’s My Dog! we’re relieved to be done with the ice and snow and excited to spring into some changes and new additions to our training and daycare programs. In March we updated our popular Day Training program to now include a private, on location, lesson. We can come to your home to help resolve things like greeting issues and other territory problems, meet you at a park to work on recalls or we could go for a walk to practice Fido’s manners in public. The addition of this lesson has been a great bonus that allows us to tailor the training plan to best suit you and your dog! We have also stretched the day training program out over a longer time period. This has made it easier for the dogs to practice and retain what they are learning. 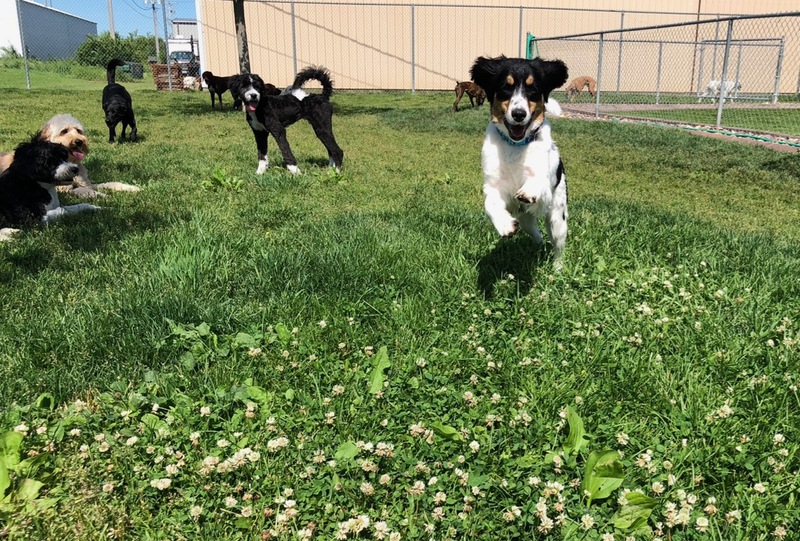 Plus, the program still includes all of the other features, including social exposure to other dogs, field trips and the Polishing and On The Go class admission! But along the way some unforeseen problems appeared. The main issue being that not all dogs enjoyed the program despite their owners best intentions of wanting their dog to have social time with other dogs. Either the dogs outgrew the desire to play with the sort of exuberance typical in a playgroup or they never particularly cared for it in the first place. From a behavioral point of view, these developmental preferences were perfectly normal…but from a business perspective, we often had to disappoint owners by insisting the dogs no longer attend the program. It isn’t appropriate to force a dog to endure a social situation that becomes increasingly stressful and many owners were disheartened because they didn’t want their dog to have to spend long days at home alone. This is why we are all so pleased to be able to bring Dog Camp to fruition. We will now be able to tailor the day’s activities to better suit the needs of individual dogs. If they like play groups, great, they can play! But if more individual time and attention is needed, we will be able to devote the time and attention to individual walks or games like fetch and tug. For dogs that need a bit more focus, we’ll work on some obedience before allowing the play and those that are mature and ready for bigger adventures will get to go on off property adventures like hiking or swimming. Plus, we will be offering this service five days a week rather than three! I’m also working on a new training curriculum to meet the needs of our more advanced students. I expect to have this class ready to start by the end of June. If you’ve completed the basics and you’re ready for a new challenge, watch for announcements. I look forward to helping some of you move to a higher level of precision and reliability with this new course! We also have our training clinics being offered on a monthly basis, including our Free Nutrition Clinic. The Scent Games Clinic is set for May 11th so if you are looking for new ways to entertain your dog, register soon. We’ll also be adding hiking outings, On The Go! locations and some second level Tricks and Canine Parkour options as we move into the summer months, so check back to the website often. Cheers to this warmer weather. We hope you make time to get out and do something fun with your dog! Previous post: New Year = New Fun with your Dog!